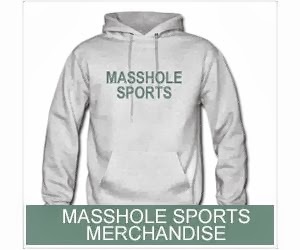 Masshole Sports: Well, He's Gone. The Denver Broncos and cornerback Aqib Talib have reached agreement on a six-year, $57 million deal that includes $26 million guaranteed, according to sources. With the New England Patriots last season, the 6-foot-1, 205-pound Talib earned the first Pro Bowl selection of his six-year career. 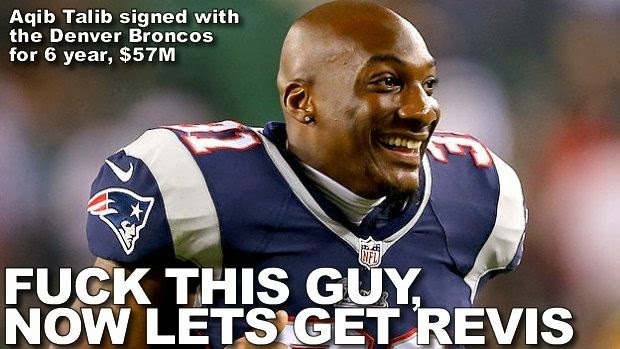 Injuries have also knocked Talib out of the last two AFC Championship games. Honestly, I dont blame him for taking that deal. I really dont. If anything, the Broncos were stupid for giving a guy with his injury history this kind of deal. $26 million guaranteed is friggin ridiculous. There is no way the Patriots would have been stupid enough to offer anything close to this. Not to a guy with a bad hip and a history of knee injuries. Hey, easy come easy go. Darrelle Revis is still out there.